SAN FRANCISCO, CA--(Marketwire - January 27, 2011) - Macworld Expo, Moscone Center, Booth #943 -- NAVIGON AG, a leading provider of mobile phone on-board navigation, today announced an upgrade to its Traffic Live feature for the smartphone navigation app MobileNavigator. NAVIGON now uses a more comprehensive traffic feed of leading traffic provider INRIX, which increases road coverage by 76 percent totaling over 200,000 miles across North America. Major changes include integration of more than 87,000 miles of secondary roads, for example city streets and arterials. While NAVIGON's Traffic Live has always provided alternative routes for traffic congestion on highways, now it can detect and reroute local and inner city traffic, and decide which of the alternatives is the fastest. 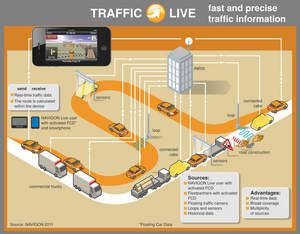 The new traffic feed is available to NAVIGON Traffic Live users automatically with no download or activation required. "The integration of traffic coverage for secondary roads is a major improvement for any driver using our MobileNavigator app," said Gerhard Mayr, vice-president worldwide mobile phones & new markets, NAVIGON. "Now the age old question, 'Do I stay on the highway or would it be faster to get off and take side streets?,' answers itself." Traffic Live utilizes real-time traffic information to calculate better routes that avoid congestion and get drivers to their destination faster. Feature integration into the navigation app MobileNavigator for iPhone and Android phones is seamless and the functionality is easy to use. The software automatically includes the traffic information when calculating a route and users receive immediate on-screen alerts via iconic warnings, indicating new incidents and congestion along the current route. NAVIGON MobileNavigator provides detailed information regarding the severity of the incident and the speed of traffic flow. Based on the real-time traffic warnings and the excellent mapping functionality the user can determine an efficient, alternative route or stay on the course. NAVIGON's traffic provider INRIX uses real-time speed data from over four million drivers, including commercial fleets such as trucks and taxis but also regular drivers with a GPS system. For example, if several vehicles on a road report slow speed, the system recognizes congestion and provides an alternate and faster route. INRIX also uses an intelligent fusion of information from traffic cameras, speed sensors and conventional traffic messages coming through a radio network. In addition, the system includes historic traffic data to assist with the prediction of road conditions when calculating a route. This includes information about traffic conditions on certain holidays or yearly events, allowing the driver to avoid taking routes that traditionally are congested on a regular basis. NAVIGON MobileNavigator is an on-board navigation app that carries the complete map material within the phone. The app relies on the GPS receiver, independent from a cell or wireless signal, providing directions and recalculations even when no cell phone signal is available. NAVIGON MobileNavigator is available for the iPhone/iPad* and Android smartphones. Traffic Live is part of the Android app and can be added to the iPhone/iPad app via In App Purchase. NAVIGON's North American iPhone apps and Traffic Live are on sale during the Macworld Expo starting today until January 30, 2011. NAVIGON AG is a world-leading provider of premium navigation technology. NAVIGON delivers software on mobile phone platforms and for the automotive industry as well as branded personal navigation devices. The company has partnerships with leading consumer electronics companies and stands for high quality products, innovation and elegant design. Founded in 1991, NAVIGON is present in Asia, Australia, Europe, North America and South Africa. -- NAVIGON. And the world is yours.